LSI00290 CacheCade Pro 2.0 with FastPath and physical key is now at Amazon here. I've worked directly with a contact in LSI Sales and another two in LSI Support, and have pulled together this CacheCade related Q&A/FAQ, with answers in red below. As always, your honest feedback is always appreciated, so I can continue to improve the accuracy of the information I provide, and focus on the sorts of articles you enjoy! Specifically, the most important part of this question is, for a 9265-8i owner like me, who already has the latest CacheCade Pro firmware 23.4.1-0028, is LSI00293 still the part # I’m waiting for? so do I go ahead and order the LSI00290? It’s confusing, I am unsure as to why we would have dropped LSI00293 in lieu of LSI00290. In fact, if you go to the main product page for advanced software, LSI00293 has disappeared… http://store.lsi.com/store.cfm/Advanced_Software_Options"
So in short, yes, go ahead and order LSI00290, it is the correct part # for the 9265-8i, and includes FastPath. 2) Will there be any upgrade pricing for CacheCade 1.0 users? (Verbal/paraphrased): No, there is no upgrade from CacheCade 1.0. Perhaps ordering that way would allow for possible future upgrade elibility? (Verbal/paraphrased): No (see also item #2 above). Last I looked, I could not find any list of tested or recommended CacheCade Pro 2.0 compatible SSDs. LSI’s site refers to such a list, but the link doesn’t take you to any such list. Will CacheCade software work with any size or model of SSD drive? This is fine, if indeed ANY SSD will work, a good thing really. But folks still wonder if there is a recommended, known-good, tested choice, just to avoid possible headaches down the road. What makes for more raw speed? Am I better off configuring CacheCade Pro 2.0 on 2 64GB SSDs or 1 128GB SSD, assuming all other specifications are equivalent? Paraphrased by one guy in support, this is not official LSI information, or flame bait! You’ll get greater performance using two smaller SSDs striped together than with a single, larger capacity SSD. But if you mirror your two smaller SSDs and compare it to using 1 SSD, I don’t think the performance difference will be as noticeable." 5) Will TRIM on the CCPro Cache SSD be possible someday? "I don’t think LSI has plans to implement TRIM. They do garbage collection called SSD Guard but it isn’t the same and you cannot get the same level of granularity that one can with TRIM. 6) Will a fix for installing MSM be made soon? I can not recommend disabling UAC, as enabling the built-in administrator works as intended. I will look into moving the install location, especially just for the Java build. Thank you for contacting LSI technical support! Please, don’t hesitate to contact us for further assistance. 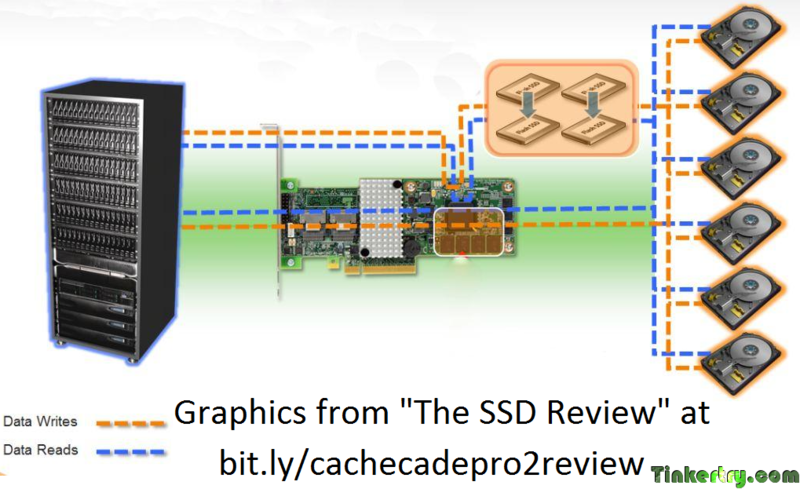 7) Does the LSI 9260-4i support RAID5 read and write caching using SSDs in CCPro 2.0? Originally, when we talked 3Q2011, it seemed only the 9265 (dual core) adapters would handle this, curious if you can confirm. You can only create CacheCade volumes of the following RAID levels: RAID 0, RAID 1, and (I believe) RAID 10/1E but as far as your data volumes go, they can be any RAID level."